A major survey analyzed which type of person is most likely to have after-death encounters or perhaps, really, which type is willing to admit it. Experiencers are socially active and wealthier than the norm. They are also independent thinkers and influential trendsetters. These are the people who have the self-assurance to stand by their experience and say, "Yes, I have met with the dead." A review of prominent, bold, and brilliant people in the past who openly admitted an interest in making contact with the dead or who actually achieved it should convince you that you are in excellent company as you embark on this quest. They include scientists, inventors, and psychologists, philosophers and religious leaders, artists and writers, politicians, including presidents and prime ministers, military men, and too many celebrities to name. 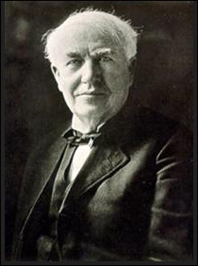 Reportedly, Thomas Edison was working on a telephone to bridge the gap between this life and the next before he died. Other scientists include Guglielmo Marconi, Nobel Prize winner for physics and inventor in the field of wireless telegraphy; the physicists Sir Oliver Lodge, Sir William Crookes, Sir William Barrett, and Nikola Tesla; the inventors Benjamin Franklin and Henry Ford; psychologists and psychiatrists William James, Carl Jung, and Elisabeth Kübler-Ross; the philosophers Socrates and Emanuel Swedenborg; several popes, including Pope Pius XII and Pope John Paul II; writers such as William Shakespeare, Victor Hugo, Oliver Wendell Holmes, Mark Twain, Robert Louis Stevenson, Sir Arthur Conan Doyle, Charles Dickens, and the Nobel Prize winner Thomas Mann; Senator Leland Stanford, founder of Stanford University (who gave a fortune to Stanford for after-death research); English prime ministers Arthur James Balfour and Winston Churchill, and U.S. presidents Abraham Lincoln and Jimmy Carter. ...The movers and shakers mentioned above are generally not afraid of the imagination but depend on it for breakthroughs. If you are not a person bursting with self-confidence, you might well fall prey to the overactive-imagination assumption. The denigrating attitude toward the imagination is an offspring of the Age of Reason mentality. In one way or another, we have all been subjected to this prejudice. Parents and teachers try to curb children's imagination and shape it according to what society deems acceptable. Here is where it all begins. When children tell their parents they have seen their dead grandfather, their experiences are dismissed as imaginary, or they are accused of lying, the same way parents react to children's past-life memories. 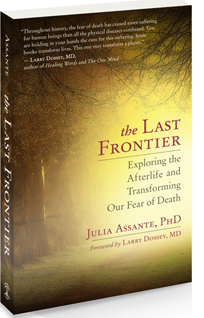 Excerpted from the book The Last Frontier ©2012 by Julia Assante. Published with permission of New World Library www.newworldlibrary.com.